This is lovely, rich, sweet, and ever so faintly tart with a hint of lemon. Even with such a large batch, I simply did not make enough. It's lovely on toast, waffles, and pancakes, of course, but is also amazing on ice cream, stirred into oatmeal, and spooned between layers of muffin batter and baked. Run the still frozen blueberries through food processor, and grind them into chunks, but don't puree them. Pour just the blueberries into a large crock pot, and cook on high, covered, until hot. 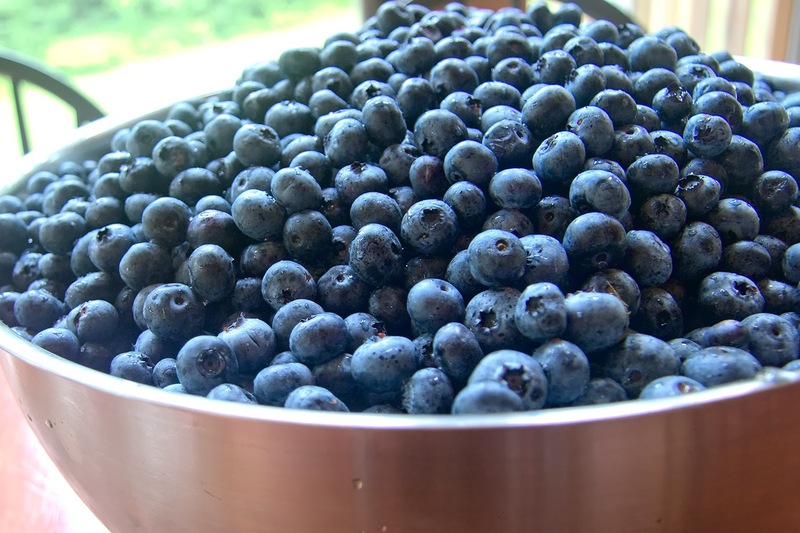 It should steam slightly, but not bubble; about 150 degrees F.
Uncover, and continue to cook the blueberries on high until they thicken, and the butter reduces by one quarter to one third. Add all of the other ingredients, bring back to temp, and cook down until desired consistency is achieved. Sterilize 16 quarter pint jars, bands, and lids. Spoon the hot blueberry butter into the jars, place on lids and tighten the bands to fingertip tight. Process in hot water bath canner for 10 minutes (15 for high altitude), then remove the canner lid and let jars cool in the canner for 5 more minutes. Remove the jars, and set on a wire rack to cool. Leave them undisturbed for 12 hours. Check all of the seals before storing. As always, can at your own risk.